This granola can be served with yogurt topped with sliced bananas or chopped apple and it is also great as a cereal. You can use it to make a healthy snack like Energy Bites as well. It is such a simple recipe and so inexpensive to make. It can be very expensive to buy a healthy (sugar free) granola, so why not make your own at home for a fraction of the cost. Remember, healthy eating doesn’t have to be complicated (or expensive), it just has to taste delicious! Optional additions: When the granola is cooled, add in your favorite unsweetened dried fruit like goji berries, raisons or cranberries. In a small bowl, add the honey and coconut oil. Melt in microwave for 30 seconds. Stir melted oil and honey into the dry ingredients keep mixing together until fully coated. 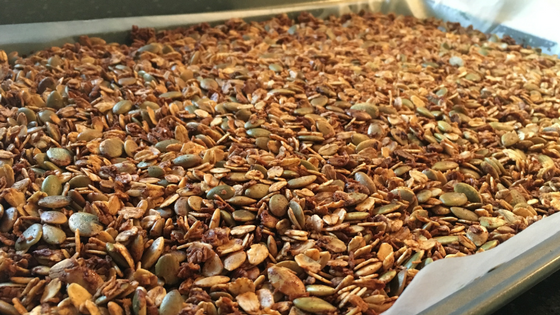 Line a baking sheet with parchment paper and evenly spread out the granola. Bake in the oven for 50-60 minutes, until golden brown. Checking frequently to ensure it doesn’t burn. Let cool fully before storing in a glass container or jar. It will stay fresh for up to 2 weeks when stored in a sealed container.